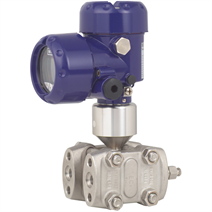 With its 4 ... 20 mA, 4 ... 20 mA HART®, PROFIBUS® PA or FOUNDATION Fieldbus™ output signals, combined with either intrinsically-safe or flameproof ignition protection (in accordance with ATEX), the DPT-10 differential pressure transmitter is ideally suited to applications requiring these features. The electronics of all transmitters with explosion protection, even for the flameproof variant, are intrinsically safe. Thus it is possible to make adjustments on the instrument in EX areas while the instrument is live. The DPT-10 is suitable for many industrial measuring requirements, such as flow measurement using differential pressure elements, level measurement or filter and pump monitoring. With diaphragm seals fitted, the DPT-10 differential pressure transmitter is also suitable for harsh process conditions. As a result of the available measuring ranges of 0 ... 10 mbar up to 0 ... 40 bar and a static pressure limitation of up to 420 bar, the instrument can be used in almost any application. The internal digital signal processing, combined with proven sensors, guarantees high accuracy and the best long-term stability. There are seven different housing variants available for the DPT-10 differential pressure transmitter and thus, it is possible to select a variant suited to every operating environment. The housing itself can be rotated through 330° and is available in plastic, aluminium and stainless steel. An electropolished stainless steel housing (316 L) is available to meet the high demands of the food industry and pharmaceutical industry. Service and configuration at the DPT-10 differential pressure transmitter is carried out using the optional display and operation module, which can be fitted in four positions. The operation menu has a simple and self-explanatory structure and has seven selectable languages as standard. Alternatively the operating parameters can be set using the PACTware™ free and non-proprietary configuration software. An instrument-specific DTM enables easy integration into a corresponding Distributed Control Systems.